Along with high-resolution 20Mp (5184 x 3888 pixel) stills, the new sensor can also capture 4K video at 24/25p or full HD movies at 50/25p. Another first for the GX8 is the inclusion of a new Dual I.S (Image Stabilization) system, with mechanisms built into both the camera and the lens to enhance performance. Thanks to its new Dual I.S. system, Panasonic claims up to 3.5 stops of “anti-shake” on the GX8 when using wide-angle focal lengths. The GX8’s weather-sealed construction offers splash- and dust-proof construction to handle difficult shooting environments, and boasts a wide ISO 100 to 25600 sensitivity range, as well as 8fps burst shooting. Featuring a built-in pop-up flash, electronic viewfinder, free-angle LCD, hotshoe for external flash, and compatibility with a wide range of Micro-Four Third-lenses, the new GX8 looks like an enticing all-in-one shooting proposition for the hybrid enthusiast. Let’s see how its sensor scores compare in our benchmark image quality lab tests. The GX8’s new 20.3Mp sensor becomes the highest-scoring Micro-Four-Thirds sensor on our database, achieving a score of 75 points overall. In doing so, it just nudges out Panasonic’s flagship hybrid camera, the GH4 with 74 points, and Olympus’s OM-D E-M1 with 73 points, into 2nd and 3rd places, respectively. While it’s fair to say the increase in resolution to 20.3Mp, compared to 16Mp on previous Panasonic models, doesn’t offer a significant advantage in terms of DxOMark sensor scores, results for the GX8 are marginally better in both the Portrait and Sports sub-categories. In the Landscape sub-category, however, the new GX8 is actually a little behind the older competition, with a score of 12.6EVs compared to 12.8EVs for the GH4 and 12.7EVs for the OM-D E-M1. But the difference between the sensor performance of these Micro-Four-Thirds cameras is so negligible that we can essentially say they offer the same image quality in terms of Color, Dynamic Range and ISO, despite the fact the GX8 benefits from greater resolution. As you can see from the Color Sensitivity & Dynamic Range charts, the Panasonic models essentially post the same results as ISO sensitivity is increased. Although results aren’t exactly the same head-to-head with the Olympus OM-D E-M1, which displays better performance at ISO 200/400 and 1600/3200/6400 for both Color and Dynamic Range, results are still pretty close throughout the ISO range. Up against the best scoring mirrorless hybrids that feature physically larger and higher-resolution APS-C sensors, the GX8’s scores are a little off the pace. With a raft of both Sony and Samsung APS-C models sitting at the top of the DxOMark database for hybrid cameras, the GX8’s overall score of 75 points doesn’t break into the top 10. Leading the APS-C hybrid pack with 87 points, Samsung’s $800 NX500 offers almost one stop better image quality overall and similar features, including 4K video. In terms of color sensitivity, the GX8’s best score of 23.5 bits is around one-third of a stop behind the leading Sony APS-C hybrid, the A6000, with 24.1 bits, and almost a whole stop off the Samsung NX500 with 24.8 bits. That advantage remains relatively consistent up to ISO 800, where all three sensors offer good color depth of over 20 bits. As sensitivity is increased further, however, the gap does widen a little, with the physically larger APS-C sensors offering the same color depth at 12800 ISO as the GX8 does at 6400 ISO. The pattern is a little different for dynamic range performance across these three sensors, however. The Panasonic GX8’s Landscape Score of 12.6 EVs is around half a stop behind the Sony A6000 with 13.1EVs, and over a stop behind the Samsung NX500 with 13.9 EVs. In contrast to the color sensitivity results, this advantage at base ISO visible narrows as sensitivity is increased however. 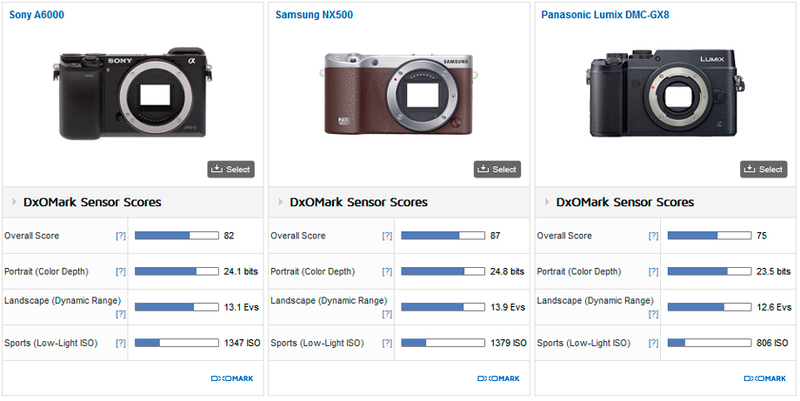 So by ISO 800 all three models post similar Dynamic Range scores of 11.17 EVs for the GX8, 11.06 EVs for the A6000 and 11.3 EVs for the NX500. All three also offer good dynamic range over 10 EVs up to ISO 1600, and although as sensitivity increases above this the larger APS-C sensors have a slight edge, there’s still not much in it. 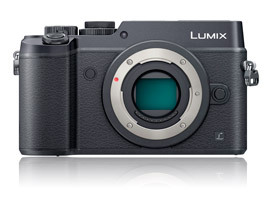 An increase in resolution to 20Mp together with 4K video capture on the Panasonic’s GX8 latest Four-Thirds chip are certainly welcome improvements for today’s competitive hybrid market. 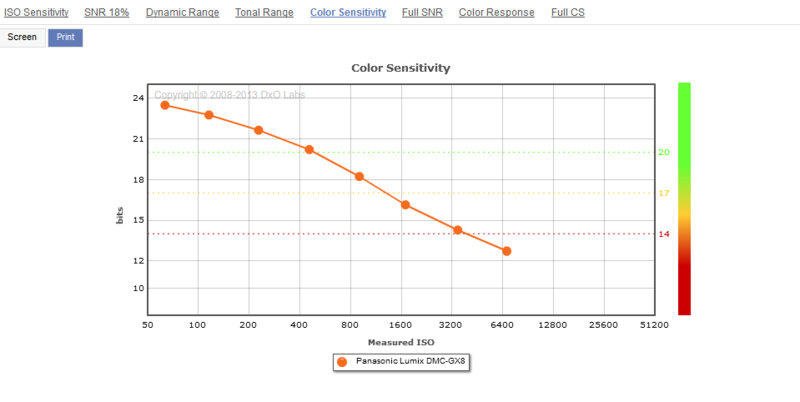 Despite the extra pixels, however, sensor scores for Panasonic’s latest Four-Thirds chip remain a little behind the APS-C hybrid competition from Sony and Samsung, and don’t offer a significant improvement over previous sensors such as that in the 16Mp GH4. With a $1198 price tag, the GX8 isn’t cheap either, but with plenty of features on offer, including the built-in EVF and flash, free-angle LCD, and Dual I.S., you get a lot of camera for your money, making it a good all-in-one solution for the hybrid enthusiast.